Tasty marinated bulgogi chicken thighs served over hot rice along with spinach and a fried egg, covered in in a sweet and spicy orange salsa and plenty of fresh herbs. When I found the recipe for the salsa naranja it was a part of a recipe for a sweet chili chicken rice bowl and given my mild obsession with rice bowls it was next on my list to make. The basic idea behind a rice bowl is that is is a complete meal in a bowl with a base of rice and from there you can go pretty much anywhere you want. Two of my favoutrite examples of rice bowls are bibimbap and the burrito bowl and I always like to experiment with new ones. I started the rice bowl with the chicken which I decided to do bulgogi style and I went with my usual chicken bulgogi recipe but I removed the chili paste since it was going to be served with the salsa naranja and given that we already had an orange theme going I added some orange juice to the marinade. 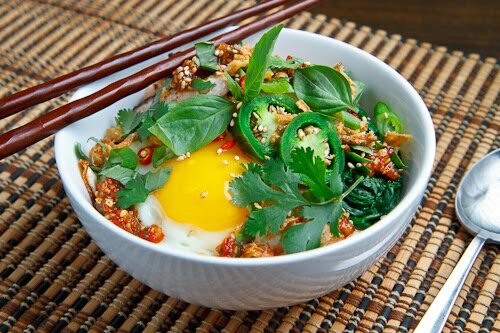 I then turned the rice bowl into a complete meal by adding a fried egg, steamed spinach and plenty of tasty garnishes like fresh cilantro and basil, sliced chilies and fried shallots in addition to the tasty orange salsa. If you are going to make this sweet chili chicken rice bowl from scratch it actually takes a bit of work to pull together but there are a few shortcuts that you can take. Although the bulgogi chicken is really tasty all by itself, the salsa is the star of the show here as far a flavour goes so you could easily replace it with leftover chicken. Speaking of leftovers, rice bowls can be a great way to finish up leftovers! Make a double batch of the chicken bulgogi the night before and use them in say, tacos, and then use the leftover in this tasty rice bowl the next day. I like to include at least one vegetable in a rice bowl and you can use pretty much anything so it is a great way to clean out the fridge of any lost souls at the end of the week. Although the salsa naranja is definitely worth making, I am sure that a basic sweet chili sauce would also be good in a rice bowl, but take the time to make the salsa naranja the day before! 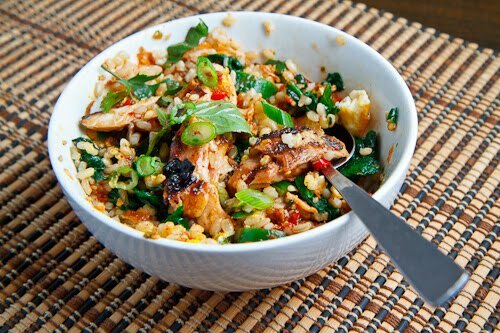 It may not look pretty but a rice bowl is much better with all of the flavours mixed up! Assemble rice bowls and enjoy. Grilled chicken thighs done bulgogi style with orange juice for a hit of citrusy brightness. Marinate the chicken in the orange juice, lime juice, soy sauce, sesame oil, garlic, ginger and the pear of a least 30 minutes to over night. Brush a grill pan with the oil and heat over medium-high heat. Place the chicken in the pan and grill until cooked, about 3-4 minutes per side and set aside. (You don’t want to crowd the pan so you may have to do this in batches. I'm having such an intense craving for this it's unreal! The sweet chili combo is one that ALWAYS appeals to me! Man, everything you make looks delishhhh. The bowl does look pretty…to me if no one else. I love how homey and comforting this looks, especially with the spice tinge of jalapenos. 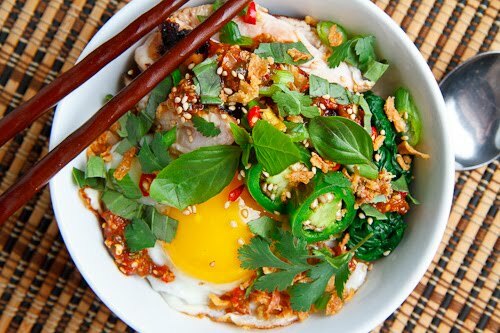 Love this Sweet Chili Rice Bowl! And, if you can believe it, I have never had a calamari taco. You have inspired me to give one a try. Thanks for stopping by Everyday Southwest, we love to make new foodie friends. I love the colours and the flavours. I think it looks very pretty all mixed up! It may not look pretty? It does look pretty…!